Strong Kirchheimer winds up for a forehand. 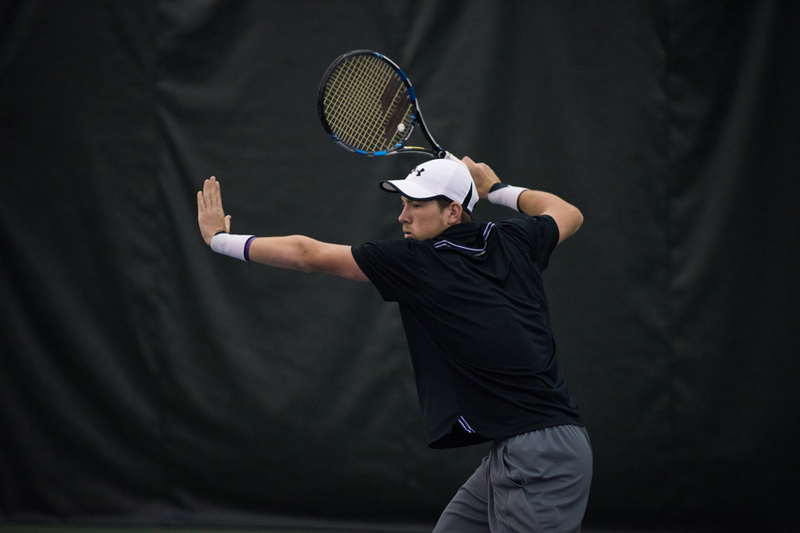 The senior lost his opening match at the ITA National Indoor Championships. Dominik Stary won every set he played at last weekend’s Big Ten singles tournament, dominating the competition en route to his first individual collegiate title. As the freshman cruised to victory, teammate Strong Kirchheimer struggled in Queens, New York, at the ITA National Indoor Championship. The senior lost in three sets in the first round to No. 3 seed Petros Chrysochos of Wake Forest. Though Kirchheimer may have enjoyed his experience in New York, Stary was on fire in Madison, Wisconsin. The No. 5 seed swept four seeded players and handled Ohio State’s third-seeded Kyle Seelig 6-2, 7-5 in the final. It was an impressive bounce back performance from Stary, who was eliminated in the second round of the ITA Regional tournament two weeks ago as the No. 13 seed. Stary wasn’t the only Wildcat who turned in an impressive performance in Madison. Sophomore Jason Seidman, the No. 7 seed, blazed his own path to the semifinals before falling to Seelig, 6-1, 6-3. Seidman didn’t lose a set before his semifinal match and logged impressive 6-2, 6-2 victory over No. 2 seed Zeke Clark of Illinois. Though Stary and Seidman found success in Madison, sophomore Michael Lorenzini and freshman Chris Ephron each won only a single match before losing in the round of 32. The result was particularly disappointing for Lorenzini, who advanced to the quarterfinals of the ITA Regional tournament two weeks ago. Nonetheless, Stary’s performance at the Big Ten event is encouraging for NU heading into the team season in January, as the Cats will have to replace last year’s No. 4 singles player Fedor Baev, who graduated, and No. 5 singles player Alp Horoz. The fall season started out rough for the Cats as both Kirchheimer and fellow senior Konrad Zieba dropped their opening round matches at the ITA All-American Championships in early October. Zieba had a similarly disappointing early exit in the ITA Regional tournament in late October, but Kirchheimer bounced back to take the championship as the second seed. After his tough early loss in New York, Kirchheimer did pick up a couple wins in the consolation bracket before dropping out there as well. Overall, the fall season will only serve as a dot on the Cats season as they roll into the winter season in an attempt to capture their first Big Ten championship since 1990.